Our clear plastic balls range in size from 50mm up to 200mm diameter, and are supplied in two halves with a hanging point on top. We hold large stocks in the UK, and most ball sizes are available for same day dispatch. 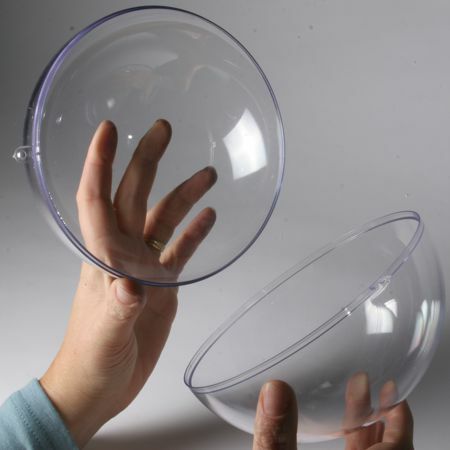 These clear spheres are manufactured to a high degree of accuracy, and are highly transparent; so there is no distortion or blur when looking into them. The middle joins snap firmly together, but not so tight that you cant get them apart when you need to! These packs of balls are neatly packed in shrink wrap. This keeps them securely together in transit, and ensures they are clean and free from dust. Buying by the box is the most economic way to purchase these shapes.The balls are securely shrink wrapped in bundles, and neatly packed into their boxes. 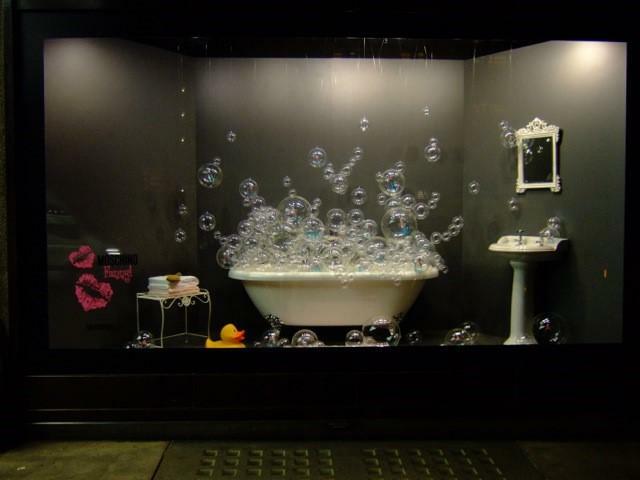 The clear plastic balls are ideal to create an effective window display. 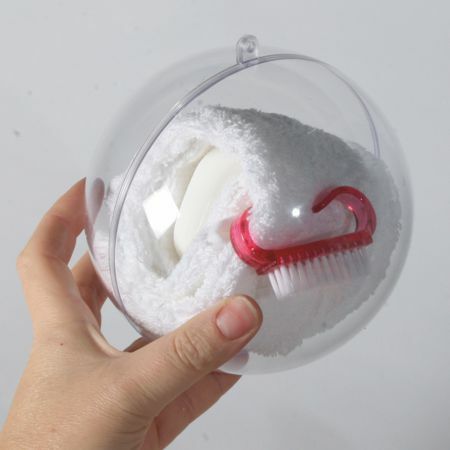 The balls can hold a variety of merchandise including socks, make up and confectionery. They can be hung from the top of the window bay, or they can also be used for in-store displays. We also supply separator discs which are ideal to hold your branding or logo in the middle of the balls and shapes. 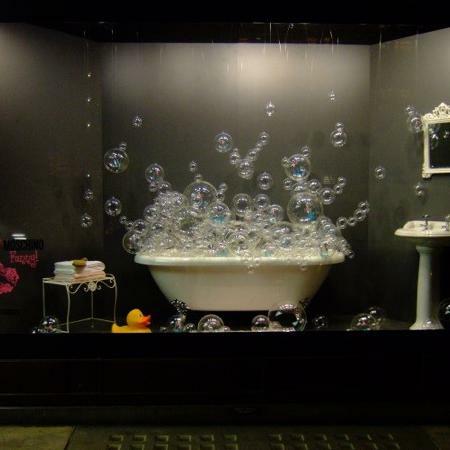 The clear plastic balls look great in this bath display as designed and installed by Ed West. The balls are an effective decoration to use as bubbles! Why not use our clear plastic balls and shapes as favours for your guests at your wedding or party? 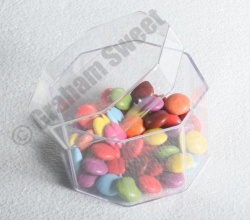 They are very versatile, so they can be used to hold items such as jewellery, sweets or cakes. 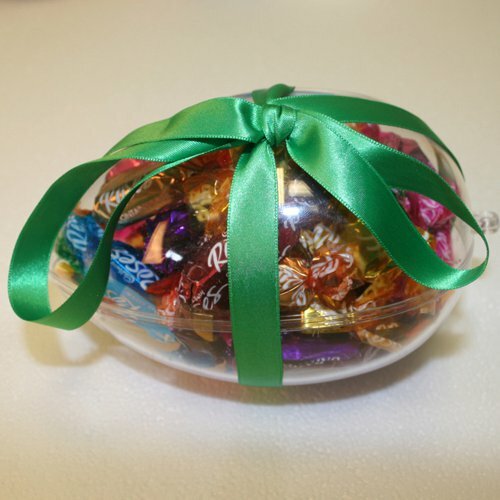 The balls are food safe, are easy open and they can be personalised by tying some ribbon in the hanging loop to suit your wedding or party theme. If you’re looking for something a bit different for your event, our clear plastic balls could be perfect to create an impact. The balls can be hung from the ceiling with some thin nylon or cotton thread, or they can be placed on surfaces around your venue. They can be filled with different materials, sweets, gifts etc.. to suit your theme, or look great on their own. The clear plastic balls, hearts and eggs are the perfect size to hold small items such as chocolate, jewellery and even small flowers. Our clear plastic eggs are a great idea to fill for children during the Easter holidays, and are perfect to create more personalised Easter egg hunts. 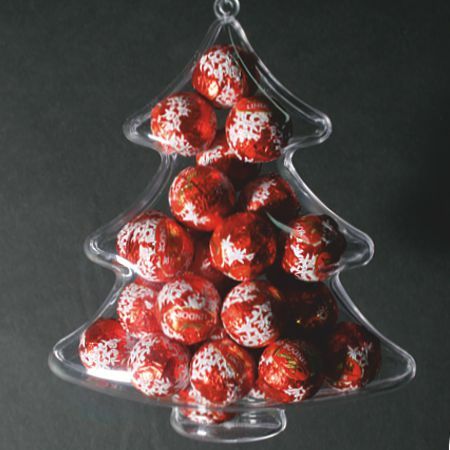 The clear plastic balls are perfect to add that extra special touch when producing Christmas decorations. They can be filled with sweets and other festive treats, as well as photos and logos. The clear plastic balls and shapes are perfect to be used as decorative packaging for small items such as socks, jewellery and small technological gifts. The shapes are fairly sturdy and will keep your items secure, while being easy to open when needed. 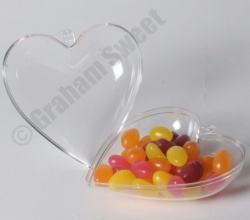 The balls, eggs, hearts and other clear plastic shapes can also be used to package a number of different small items.